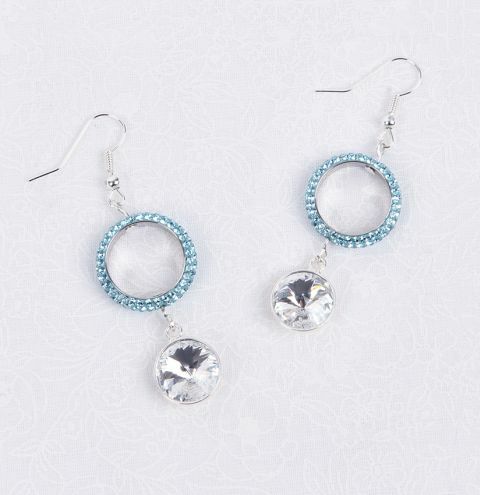 Learn how to make these super sparkly earrings with Swarovski crystal. Glue your rivoli crystal into the setting and wait for a few minutes for it to dry securely. Take one of your headpins, thread it through one of the holes in your Swarovski 2 hole ring. Thread outwards so that the nail head end of the pin is against the inside of the Swarovski ring. Bend the pin to a 90 degree angle just as it comes out of the ring and create a loop using your round nose pliers. After making your loop, open it and attach your rivoli crystal in its charm setting. Repeat this on the other side of your Swarovski 2 hole ring, adding another headpin to the top and attaching your ear wire. Repeat this for your second earring.